An air filter is an essential yet often overlooked component of a healthy HVAC system. This lightweight barrier traps dust, allergens, and other rubbish from entering the air you breathe. It also makes your HVAC system’s job easier, improving its lifespan and minimizing the need for repairs. However, most people don’t change their air filter as often as they should, leading to an array of problems. By understanding the consequences of using a dirty air filter and how often to replace it, you can save money and improve your comfort and health. Here are some tips from a leading HVAC company in Anaheim. What Happens if You Don’t Replace Your Air Filter? High Energy Costs. A dirty air filter stifles air circulation, forcing your HVAC system to work overtime to heat or cool your home. This leads to higher electricity bills and can shorten the lifespan of your HVAC unit. Inconsistent Air Temperature. Because the HVAC system is struggling to blow air, certain areas of your home may be hotter or cooler than you’d like. A dirty air filter can even interfere with the temperature sensors that signal your HVAC system to start or stop. The result is discomfort, inefficient operation, and repair costs due to high strain on the fan motor. High Risk of System Failure. A worn out fan motor combined with difficulty in moving air inevitably leads to overheating or freezing up. The air that would move freely through a clean air filter becomes trapped behind a dirty one, placing high energy demand on your HVAC system. Poor Air Quality. A dirty air filter traps not just air, but moisture. Under humid conditions, this promotes the growth of bacteria and mold, which further clog up the filter. Even worse, these microbes can spread into the HVAC system and into the air in your home, causing allergic reactions and other health issues. Left unchecked, this can cause long-term health problems, especially for young children and the elderly. Dirty Air Ducts. A buildup of pollutants in your air ducts further reduces the efficiency of your HVAC system and increases pollutants in the air throughout your home. Changing your air filter is much quicker and easier than dealing with the fallout from polluted ducts. Many people elect to change their air filter twice a year, usually in the spring and fall. However, its best to change your air filter at least every other month, especially in spacious homes or if you have pets. Fortunately, air filters are low-cost and easy to replace on your own; simply remove the dirty filter and set the new filter in place. Just make sure to review your system’s documentation to identify the proper size and type of filter you need. 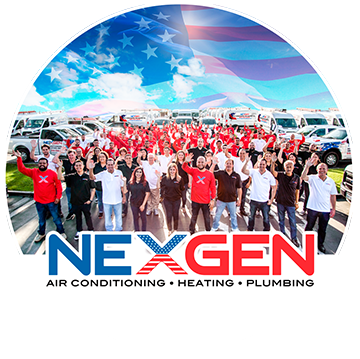 To learn more about the importance of air filters and other tips on maintaining your HVAC system and improving the quality of air in your home, contact NexGen Air & Heat. As the premier HVAC company in Los Angeles, we take pride in helping customers save money and breathe easy.